If you think this tip looks familiar, it’s because I modified a line from a popular Bright Eyes song, Road to Joy. An awesome song, and very talented artist. Just one left to go in this series. Really hope you’ve been enjoying them. Last one? What about the other 100 tips? It’s just the last one in this particular 7-strip run. There’s more in the works. Stay tuned :). I suppose winning wars would help anyone get closer to immortalhood! Fantastic stuff, fellas! He’s immortal; all conflicts seem pointless to him. Pretty much, yep. The only wars he’d care about are the ones he starts. It’s pointless. Nobody wins. Word is bond. 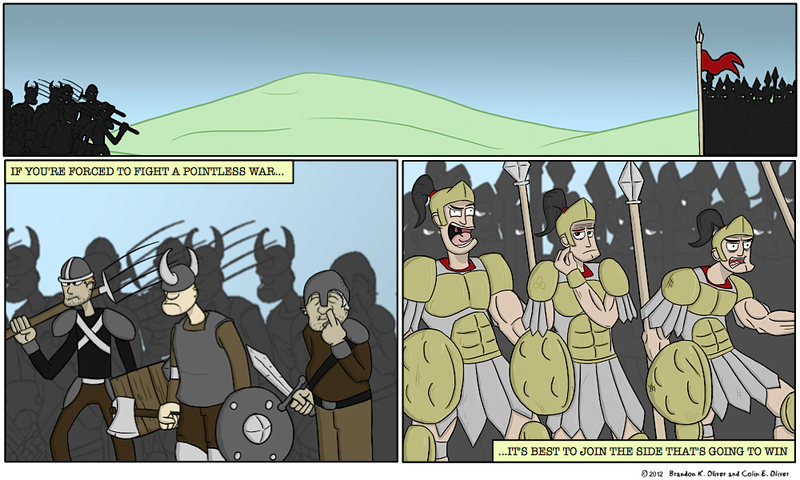 You don’t think pointless wars have winners? That’s the way I pick all of my battles. Were it so easy :). Immortals live interesting lives. Over and over and over again. I’ve been digging this TFI series! Well done, guys! Thanks :)! Super glad to hear it. We’re hoping to continue it in some fashion after this series is done, so stay tuned ;).